Incredibly successful in their ability to adapt to different climates and geographies, Turks created gardens that satisfied pleasures and addressed a variety of needs. Before the Ottomans, Turkish groups who settled in Anatolia by way of modern-day Iran built gardens that demonstrate the influence of Persian quadripartite garden layout and a culture of intersecting watercourses. This can be seen, for example, in the Artuqid palace garden, which is designed around a mosaic-decorated pool and a water channel; in the thirteenth-century Diyarbakır Citadel; and in the gardens of the Seljuks’ great Kubadabad Palace near Beyşehir in central Anatolia. Only a few Ottoman gardens, however, such as the Karabali and Sultaniye gardens in Istanbul, seem to have been influenced by Persian models. The more direct influence was Byzantine garden culture. A development of Roman model, Byzantine gardens featured pools and fountains but lacked the severity of formal layouts. In any case, the Ottomans proved adept at appropriating from other cultures with which they came in contact those elements that suited their own traditions and reinterpreting them to create a new synthesis. Although Ottoman gardens were not strictly formal, neither were they disorganized. Ottomans sought practical solutions that suited the topography, dimensions, climate, and in general, the ambient conditions of the garden’s location rather than adhering to a particular set of fixed rules, and their first principle was to integrate gardens with nature. They enriched and embellished what nature already provided, creating gardens wherever running water existed rather than building watercourses, and planting trees and installing flowerbeds so as to preserve the appearance of natural development of the setting. In addition, references to “garden-construction” and statements indicating that the sixteenth-century architect Sinan landscaped at least some gardens during the reign of Süleyman II indicate that architects oversaw the landscaping of Ottoman gardens in and around Istanbul. The palace and privy gardens that the Ottomans created in different places illustrate how local conditions, rather than fixed cultural models, informed garden design. Palatial models include the garden inside Bursa citadel, with its abundant supply of water; the garden of Edirne Palace, built on deliberately created ground located between two rivers; the gardens of Topkapı Palace in Istanbul, descending the slopes of a prominence surrounded by sea on three sides; and the Üsküdar Palace gardens, which overlook the Marmara Sea. Privy gardens include those at Küçüksu, running from the seashore up the hills on either side of a pleasant creek on the Bosporos, and Kağıthane, on the Golden Horn in Istanbul. 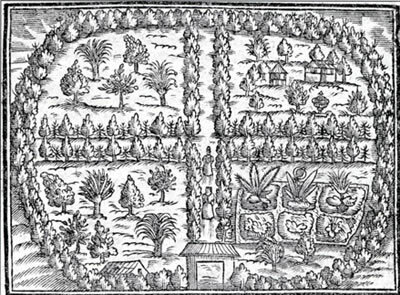 European visitors to Istanbul in the sixteenth century, impressed by flower-filled Ottoman gardens, exported flowers and trees back home. Ottoman models influenced the design of European gardens in the seventeenth century, but this was reversed in the nineteenth century, especially in Istanbul, when Europeans were recruited to design and lay out palace gardens entirely in European fashion. ocuments, historical sources, and visual materials. These include Ottoman miniature paintings and European engravings, as well as sources and publications, both Turkish and foreign, that cover most of the Ottoman imperial gardens. The critical discourse on Ottoman Turkish gardens developed in the late 1950s. The seminal work is Muzaffer Erdoğan’s 1958 article, “Osmanlı Devrinde Istanbul Bahçeleri” [Gardens of Istanbul in the Ottoman period]. Gönül Aslanoğlu Evyapan’s 1972 book, Eski Türk Bahçeleri ve Özellikle Eski Istanbul Bahçeleri [Old Turkish Gardens and Old Istanbul Gardens in Particular], was reprinted in English in 1999 and gives an extensive list of gardens, especially in Istanbul. Sedad Hakkı Eldem’s study on gardens, entitled Türk Bahçeleri [Turkish Gardens] (Istanbul, 1973), focuses on the elements of garden architecture by drafting plans and sections of both surviving and no longer existing Ottoman Turkish gardens and parks, especially along the Bosporos in Istanbul. Gülru Necipoğlu, in her 1991 study of Topkapı Palace, Architecture, Ceremonial and Power: The Topkapı Palace in the Fifteenth and Sixteenth Centuries, provides a detailed analysis of various gardens in the palace complex and gives evidence for imperial garden life. In her 1997 article “The Suburban Landscape of Sixteenth Century Istanbul as a Mirror of Classical Ottoman Garden Culture,” Necipoğlu identifies a number of sixteenth-century gardens along the Bosphorus in manuscripts and texts by foreign travelers. My recent work on Ottoman imperial gardens of the classical period, entitled A Garden for the Sultan: Gardens and Flowers in the Ottoman Culture, published in 2002 in both Turkish and English, stresses the place of gardens within Ottoman culture and highlights the rise of interest in flowers and its impact on all Ottoman art from the sixteenth to nineteenth centuries. The new edition of this book, 15. Yüzyıldan 20. Yüzyıla Osmanlı Bahçeleri ve Hasbahçeler [Ottoman Gardens and Imperial Gardens in the 15th–20th Centuries] (Istanbul, 2005), also includes gardens of the later periods. My work on Ottoman palace gardens in both books combines Ottoman sources, including miniature paintings, with foreign traveler’s chronicles to identify the elements of Ottoman palace gardens. Recent dissertations on Ottoman garden culture focus on different periods or employ other sources, such as poetry. Özlem Salman’s 1999 dissertation, conducted at Istanbul Technical University, focuses on late Ottoman gardens. 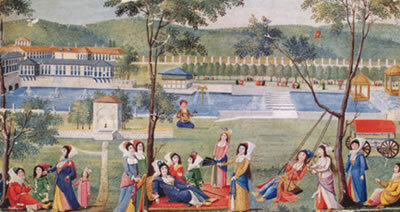 Shirine Hamadeh's dissertation, “The City’s Pleasures: Architectural Sensibility in Eighteenth Century Istanbul” (MIT, 1999), sheds light on the relationship between gazel poetry and garden life in eighteenth-century Istanbul, showing how the modernization of Ottoman garden and city culture developed between the Tulip Period (1718–1730) and the beginning of Ottoman westernization in the nineteenth century. 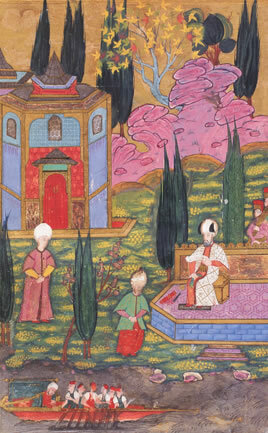 More recently, B. Deniz Çalış's 2004 dissertation, “Ideal and real spaces of Ottoman Imagination: Continuity and Change in Ottoman Rituals of Poetry (Istanbul 1453–1730),” conducted at the Middle East Technical University, Ankara, and at Dumbarton Oaks, examines the concept of garden and space in şehrengiz poetry from the sixteenth through the eighteenth century and studies imagined and real practices of garden rituals.